A fragment of historic wall, or a concrete curb? When the heritage administrators were contemplating the declaration of the old Jewish cemetery in Prostějov as cultural heritage, they stated in their comment that “the only original structure of the Jewish cemetery site that still remains is a fragment of the boundary wall, located on the western perimeter, has been preserved;” it was also drawn in the supporting documents for the declaration. This quite robust curb originally enclosed almost all the historic site of the cemetery in Tyl Street. A small part was removed a few months ago when the sidewalk was broadened. 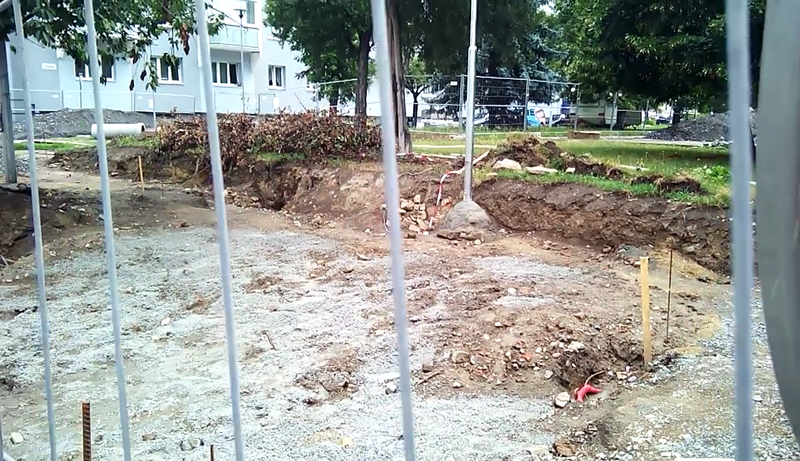 The rest went a few days ago in the reconstruction of the crossing; by then, however, the entire site of the old cemetery had been declared cultural heritage. 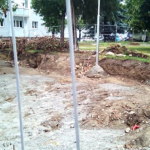 Although the declaration is still inconclusive as the Prostějov council appealed it, the council was obliged by the law at least to notify the heritage administration of its intent to demolish the fragment of the wall; this was not done.